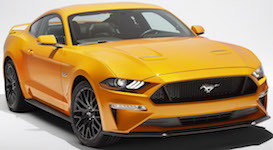 The 2018 Mustang GT features a 460hp 50L V8 (25 horsepower over the previous year), dual exhaust with quad tips, LED fog lamps, rear decklid spoiler, unique high-gloss black painted front grille, unique requre valance, 3.55 limited-slip rear differential, engine cooler, reverse sensing system, SYNC, and silver arrow aluminum dash trim. Optional packages include the GT Premium, Premium Plus, Black Accent, Carbon Sport Interior, Ford Safe and Smart, GT Performance and GT Performance Level II. This amazing 2018 Mustang GT in Royal Crimson exterior paint is owned by George of Arkansas and is our Attitude Of The Week starting March 3rd, 2019. Besides the amazing paint this Mustang has a 10 speed automatic and GT Performance Package option which includes the front air splitter, 19 inch Ebony Black-painted aluminum wheels, performance tires, and rear wing/spoiler visible in this image. Check out this 2018 Mustang GT painted in Kona Blue. This color returns after it disappeared in 2015. Check out this Ingot Silver 2018 Mustang GT coupe.